The DIA Group understands digital transformation as a fundamental axis for customer closeness and knowledge, as well as a step towards improving efficiency. The capacity to transform data in information and information in knowledge is allowing the company to optimize all of its decision-making processes at all levels, streamlining systems in stores and warehouses, in addition to developing new sales channels that pursue its strategy of proximity purchasing. In 2016, the company set up a transversal work group, with the participation of all the countries, for the internal development of new digital applications aimed at making life easier for three of the main cornerstones of the company: customers, franchisees and employees. In order to create the most cutting edge and agile apps in the sector, in each country where the company operates it uses networking to promote knowledge and synergies between markets, always with the invariable premise that the codes used in the applications can be reusable and are applicable in all countries. The projects on which this team is working are mainly focused on closeness and knowledge of the customer, with new functionalities in the area of e-commerce, with enhancements in the order system and services for employees and franchisees, as well as renewed in-store management systems for supervisors. In this regard, for many years the company has maintained an application for the use of supervisors, store managers and other store personnel that is being updated in accordance with new requests and needs. In 2016, some apps relating to this new project were already implemented, as is the case of the new store management mobile application, for both franchisees and own employees, which enables the streamlining of daily tasks in the store and avoids the double work of having to write things down on paper and then enter the same codes and amounts in the main cash register. All of the functionalities offered by this application enable greater flexibility of tasks, better quality procedures to further reduce errors, greater simplification in terms of access to information and more effective customer service, given that there is access at all times to information to respond to questions raised by customers (price, stocks, offers, etc.). This application can also manage returns, rectifications and direct merchandise, all through mobile devices. For now, the application is available in stores in Spain and China, and in the case of the latter, franchisees can place their orders directly through the mobile application without the need to go through the sales terminal. 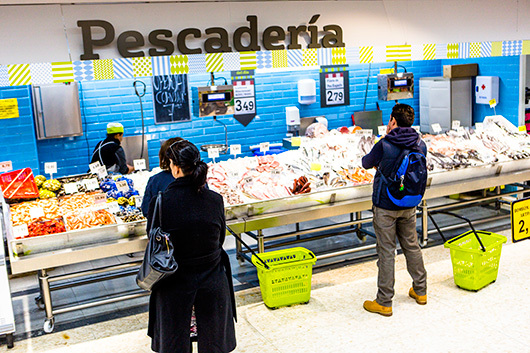 Store Inventory, another application aimed at making daily management more efficient, was implemented in Spain during 2016. Both employees and franchisees can now count items in the store and generate files through a simple and intuitive application. An updated inventory helps stay up to date with the financial situation of a business, control stocks, and have more accurate knowledge of customer needs. The company has a free App for iOS and Android to manage online purchases using mobile devices. The tool allows customers to create shopping lists for their usual store based on the actual product assortment, use discount coupons, check the location of the nearest store, control spending by measuring monthly expenditure, and keep up with the latest company news in regard to new openings, special offers, etc. In the course of this year, new functionalities have been introduced, such as the possibility of receiving a digital loyalty card or a ticket server that provides real-time information regarding the purchase and savings obtained with the same. For the time being, this application is available for the Spanish market, with the intention of opening it up to the rest of the markets shortly. In 2016, the DIA application was among the most downloaded, with over 500,000 downloads in just one year. In 2016, a mobile application was implemented to improve transport services that enables real-time follow-up of the deliveries made by logistics managers. This application permits daily monitoring of the frequency of service in order to adjust and implement improvements quickly, with a view to guaranteeing that the sales of the establishment are in accordance with the reserve capacity. 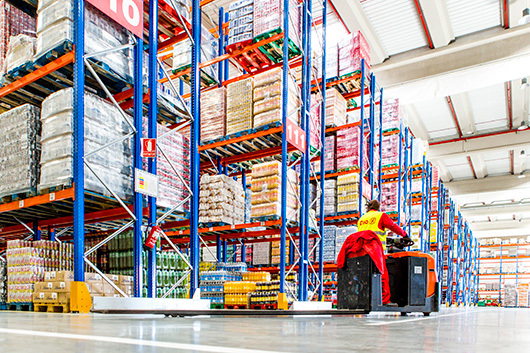 This achieves more efficient planning of warehouse resources, as well as transport and store planning. At present, this project is in an initial stage in Argentina and its implementation is planned for Spain and Portugal in 2017. With these new applications, the DIA Group intends to reinvent multitasking, making it possible to carry out internal and external procedures on the spot. Moreover, this system enables better traceability of actions, in addition to increasing the speed and quality of store processes, leading to better productivity that will ultimately benefit the customer. The company’s aim is to gradually introduce it in the rest of the countries according to needs. In parallel to these projects, during 2016 a project was implemented focusing on the digitalization of the POS of establishments in Spain under the name of Project Vela. Store streamlining processes represent an organizational and management revolution, which aims to get closer to the customer and improve productivity. This involves a new computer system that makes it possible to centralize the necessary back-office functionalities to manage stores (stock control, orders, etc.). To achieve this, it has been necessary to install new architecture in the central systems that can serve as a platform not only to centralize all the information, but also to do so in real time. Access from the point of sale is made from a new graphic interface developed with productivity criteria and ease of use for store personnel. Thanks to the new architecture, centralization of functionalities, real-time management and graphic interface, the DIA Group can digitalize a large number of processes, eliminating paper in their management and making them much more efficient. At the close of 2016, the system had already been installed in four pilot stores in Madrid and the main launch in Spain is planned starting in January 2017. Like all the projects launched by the company, this also has an international profile, and during 2017 it will therefore be gradually rolled out to the other countries in which the company has a presence. In addition to progress in the area of internal management and processes, during 2016 each country worked on diverse e-commerce projects and commercial digitalization, opening new channels with the customer, bringing the company’s offering to more potential consumers. In line with these priorities to continue developing the e-commerce channel and taking advantage of the pertinent opportunities to improve customer relations and communication, DIA’s business in Spain ended a significant financial year in terms of digitalization. During this financial year, DIA Spain has grown its online business nationwide, and it currently serves 15 million customers in 19 provinces (Madrid, Barcelona, Málaga, Seville, Córdoba, Cádiz, Palma, Alicante, Valencia, Huelva, Almería, Zaragoza, Vizcaya, Murcia, Granada, Pamplona, Valladolid, Asturias, and Pontevedra). 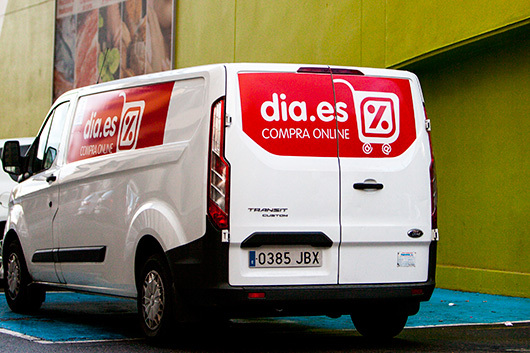 In 2016, the DIA virtual store in Spain tripled its turnover, with more than 14 million visits to its different platforms. The DIA online store features a range of over 4,000 SKUs, including some specific products not found in the brick-and-mortar stores, and has already become the lowest-priced store in the entire company, thanks to its competitive prices and promotional discounts. 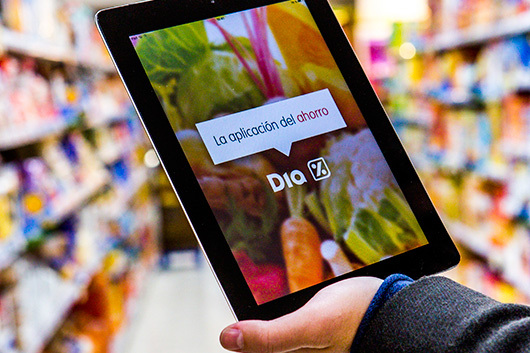 The food product offering through the network is completed in Spain with the website La Plaza de DIA (http://www.laplazadedia.es/), from which online orders can currently be placed in the Community of Madrid. This site also gives information on offers and upcoming openings, as well as providing gastronomic and culinary advice. DIA’s online commercial offering also includes the non-food segment: on its Oportunidades.dia.es website, the company offers a product range in Spain of more than 1,000 SKUs of electronic, household, beauty and technology products. In 2016, the ‘Opportunidades’ offer also included physical stores in Spain, both own stores and franchises. Customers can now place their orders by catalogue in the stores and receive the items at home. Likewise, the launch last year of the Clarel.es website, the DIA format specializing in personal hygiene, cosmetics and beauty, allows customers to organize their purchases through an online catalogue split by category or through information content and interaction with customers who offer advice, make-up videos, etc. The company offers this service throughout Spain, coordinating orders from a single warehouse located in the Zaragoza region, in the town of Almunia de Doña Godina. In 2016, Argentina worked on the development of new online sales channels that aim to make life easier for customers and adapt to new consumer habits. In October 2016, the Oportunidades DIA flash sales website was implemented in Argentina, where electronic, technology, household appliance, baby and even travel products can be purchased. Along the same lines as the website launched in Spain in 2014, this digital sales platform contains products and offers that are not found in physical stores, and that are sold at very competitive prices. Through Oportunidades DIA, customers in Argentina can receive their orders at home anywhere in the country, have access to considerable discounts and use promotional codes received by email. As a new feature of the commercial offering, DIA Argentina launched a new brand of household appliances exclusive to the company through this channel, under the name of Bixler. This is a group of small household appliances that benefit from free delivery. Throughout 2016, DIA Argentina worked on achieving a closer and more direct relationship with the customer, especially on the development of new digital strategies on its own platforms and Social Networks. Special mention should be given this year to the launch of “Ahorrames de DIA”, whereby customers using the DIA Argentina website can benefit from significant discounts on 30 specific products that vary each month. The digitalization effort carried out by the DIA Group in 2016 also extended to business in Brazil, where digital marketing and the opening of new channels of dialogue with customers have been the focus of much of the year. The digital community of DIA Brazil is one of the Group’s largest, with more than 1.2 million followers on Facebook and over 2.7 million views on the corporate YouTube channel. The group banners in the country have a good reputation, driven largely by the community of “Experts in Economy”, which has over 20,000 registered customers, and the promotional actions focusing exclusively on the online channel. Also in Brazil, a noteworthy effort has been made this year to attract new franchisees through digital tools and the company’s website dedicated to franchises. In the case of China, where the online channel currently represents 16% of the country’s total retail sector, DIA has been working on digitalization aimed at opening new lines of communication with the customer. 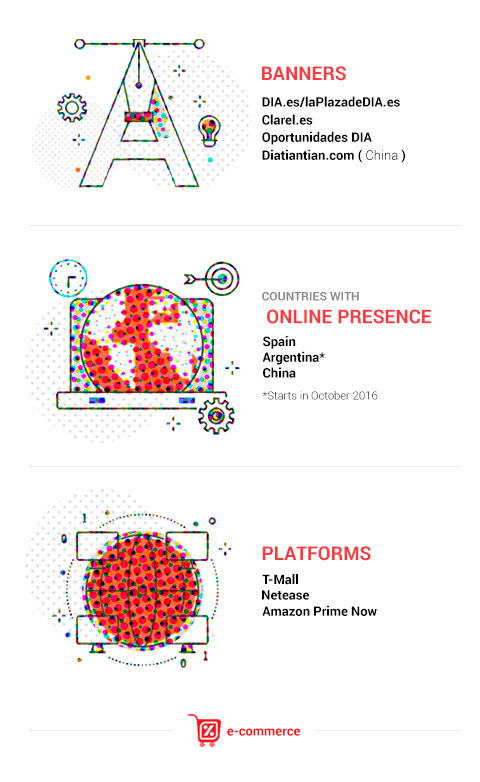 In October 2016, DIA China signed an agreement with the online services company Netease to promote the company’s online commerce in China, through the Kaola.com application, one of the largest internet sales platforms in the country and owned by Netease. At present, a portfolio of more than 200 own-label and national brands are sold on this platform. The aim of this new partnership is to provide better service to customers in China to help them in their daily shopping and allow them to buy Spanish brands, with greater added value both in its own-label products as well as national brands. This agreement comes on top of the one signed in November 2015 with the largest Chinese marketplace, T-Mall. Through this online B2C (business to customer) sales platform, part of the Alibaba Group, the DIA Group already sells more than 150 imported products with high added value throughout China, in addition to its premium banner, Delicious. The platform also makes it possible to expand access to DIA products to areas where the company does not have a physical presence. In fact, 85% of sales generated through T-Mall are made outside of Shanghai, the city where DIA does have physical stores. In 2016, DIA China also worked on developing e-commerce. Through the commercial website www.diatiantian.com.cn, DIA already provides services to the city’s central area, with a population density of over 40,000 people per square kilometre. The order is prepared from a network of 21 own stores, with the customer choosing the date and time slot for delivery. The customer can choose to receive the delivery at home or can pick it up at the store - whichever is more convenient. 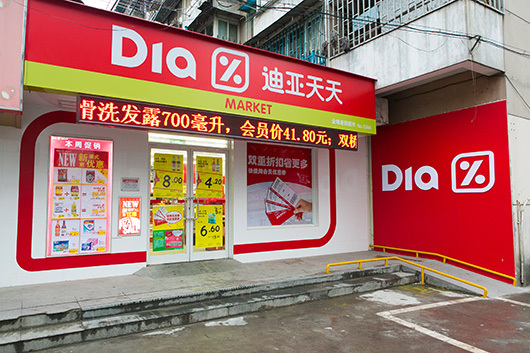 Since the end of 2015, DIA customers have been able to pay for their purchases using their mobile devices at all own stores in China. Thanks to the WeChat platform, they can use a payment procedure attached to a bank card, thus providing customers with a secure and efficient service.